I’m not a gun nut but I love badass machines and this photo of US Marines firing a howling M777 Howitzer is mechanical awesomeness dripping with badassery. I can almost hear the thumping blast of the Howitzer firing from just looking at the picture. It’s, yep, pretty badass. 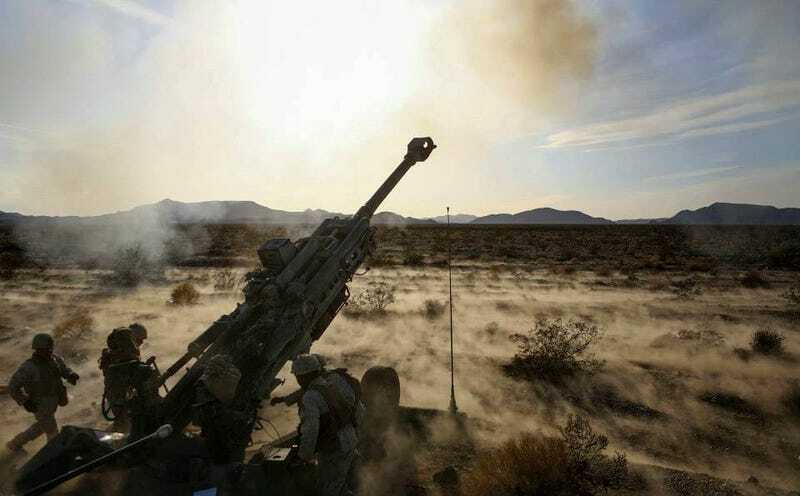 Marines with 1st Battalion, 11th Marine Regiment, 1st Marine Division, fire an M777 howitzer during Exercise Desert Scimitar 2015 aboard Marine Corps Air Ground Combat Center Twentynine Palms, California, April 7, 2015. The tough, realistic live-fire training central to Desert Scimitar allows Division units to train in order to maintain readiness and meet current and real-world operational demands.